In the late 1990s, an organization called Envision Utah brought together a broad spectrum of people to figure out how to plan for major population growth. They started by asking participants to mark out areas that shouldn’t be developed — wilderness, national parks, agricultural land. Then, they had to figure out how to fit future residents in the developable areas that were left. They concluded that the way to do that without massive congestion, soaring public costs, and environmental ruin was to build walkable development with good transit access. How do you get people to ride transit? Make it convenient, and make it serve their needs. 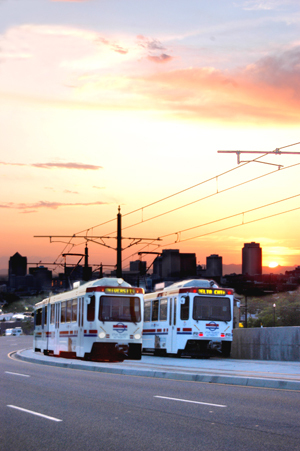 Ever since, Utah has been a national leader in transit-oriented growth, putting into practice the values Utahns articulated during a long and painstaking public process. I recently caught up with Robert Grow, chair of Envision Utah, to hear how they did it. We published the first part of our conversation yesterday. Here is part two, lightly edited for length and clarity. I wanted to ask about the building of transit, especially the TRAX light rail. The impression I had was that the Utah Transit Authority was already on that track and doing that separately and that your contribution was more in bringing the public along. They had a vote in 1992 to fund the first line, and the vote failed. UTA are magicians at finding the ability to get things done; they then were able to scrape together the resources to start that first line. So at the time we did the vision there was a first line underway, but before the vision, a lot of people in Utah were skeptical about rail. When we came out of the vision, over 80 percent of Utahns — it was the high 80 percent range — were in favor of expanding the system rapidly. Then the public voted twice to fund the system. So were there plans? Were there lines on maps? Absolutely. In fact, we did a bunch of those lines on maps as part of the scenarios. And then the public saw that if we build a rail system, along with expanding the other transportation modes, their lives would be better off. They’d spend less time in traffic. They’d have choices of how to get around. As the region grew — if you model out 25 years — it becomes more and more obvious you need a multi-modal system. The result was an attitudinal shift when people saw their values would be served better if we had this multimodal approach. And so, yes, UTA was underway. They were smart, entrepreneurial; they’re great friends. Call up Mike Allegra, who runs UTA, and ask him what got him the money — and he’ll say Envision Utah. So the last vote, we actually voted to take the entire 2030 system of rail and build it all by 2015. Nowhere else in the country has done anything like that. It’s one thing to convince people that transit is important, but then how do you get them to actually ride it themselves? A lot of people say, “Transit is great; it makes the roads less congested for me to drive on.” How do you get them to ride it? How do you get them to ride it? You make it convenient, make it serve their needs, make them realize they can live with one car — or no cars. The fact is 80 percent of the people who ride our rail system have a car in the garage. We’re not a place where people ride it because they have no choice. We’re a place where people ride it by choice. And you expand it so it’s a true system. So you don’t have 10 places where you can get on and get off; we have 72 stops now, plus the bus system that interconnects everything. The truth is, you don’t have to convince people to do what’s good for them. People are pretty darn smart. People can live with the extent of the system we have now — we have about 200,000 people in these valleys who can walk less than 1,000 steps and get on a high-quality transit system. And we’d like that to be, eventually, 800,000 or a million. Over 25 percent of the students at the University of Utah [take transit]. University of Utah is reclaiming parking lots and building buildings and saving a lot of money. The games at the U, the trains are all full of people dressed in red, the Utah colors. They stack up the trains so they can get a lot of people there at once and take them back. We have a transit system that’s really good at figuring out the convenience factor, the service factor. Did you do parking reforms along with the transit build-up? No, that was not one of the strategies. The answer is, if you want a lively downtown where people will live — and you need commercial downtown, you need restaurants downtown, you need the full spectrum, grocery stores downtown — but to do that, people have to shop downtown. And if you make it inconvenient for people to come downtown and shop, you can hurt the development of your downtown. If you’re London and everybody’s got to come downtown anyway, congestion pricing works. Nobody in the west has really tried a strategy like that. Because we want our downtowns to be vibrant. You’ve got to be careful how those incentives work. You want to get people out of their car, but one of the ways you want to do that is you want them to live downtown. So the answer is no, but that will come up in this visioning process. Yes, I wanted to ask about your new initiative, the “Your Utah, Your Future” campaign. Is this the next phase of Envision Utah — are you just trying to update your results — or is it qualitatively different from what you did before? The tools we had 15 years ago were like cooking on open stove, and now we have microwave ovens and convection ovens. We have these fabulous new tools to look forward to the future and model urban areas and metropolitan areas. We had a $5 million HUD grant — the “we” is our region — and we’ve been developing what is probably the best set of tools in America. That’s one. Number two, our first effort covered the Wasatch Front and Back, which is where 80 percent of Utahns live, and that’s where it’s growing the fastest by far. But our effort will be statewide. In the interim since our first effort we’ve helped do visions in other parts of the state. Now we’re going to do a statewide effort to bring all of that together in one long-range vision for the state. We’re going to look out to 2050. And we’re going to model, using the best tools possible, lots of different choices and show different outcomes. Does the immigration debate sometimes pop up in these discussions? When you talk about the potential problems associated with unplanned growth, do some people just say well let’s not grow, let’s keep immigrants and newcomers out; let’s batten down the hatches? Utah faced the immigration question a couple years ago after Arizona passed their law. We, of course, have people on all parts of the spectrum on immigration. But Utahns came together and developed what’s called the Utah Compact. The Utah Compact fundamentally said these people are our friends; they’re our neighbors; we don’t favor breaking up families. The community did a good job of looking at the issue and saying diversity adds to the community, it provides new opportunities, and in a very unique way it makes this a richer environment in which to raise children. So when we updated our original values study in 2007, we saw an emerging value ladder on diversity as a positive. A lot of what we do has to do with understanding what Utahns value, and helping look at the future in light of those things they value. “Hundreds, Hundreds, and Hundreds” interesting use of the English language. To other readers that are unfamiliar with Ms. Diaz she is an anti-UTA person. She is upset that UTA cancelled a bus route by her house, due to low ridership and budget constraints. She currently owns a blog titled “UTA is Sweatshops on Wheels.” So take her comments with a grain of salt. I am not looking a Bus Stop in Front of my House I am looking for a Frequent Bus System for all. I am a Big Fan of the Fitted Bus Route System. I have a Good Friend that needs to be to Trax 5:00 AM to go to Work, in the Winter he has to Walk in the Street. UTA has very Poor Customer Service. NTHCLLWY you are “COWARD” you will not Identify who are!! I would Welcome a Real Investigation into Utah Transit Authority. UTA is so Good at LYING. UTA is not Transit-Oriented. I’m a coward because I do not want identify myself? If I did identify myself you would probably harass me like you harass UTA. I walked to the Trax station by my house this morning, in the street as well. I’m not really sure what that has to with UTA. They are not responsible for clearing sidewalks. I’m not saying UTA is without problems. I certainly wish that they would operate longer hours, especially on the weekends, and I dislike the executive bonuses as well but your other criticisms are not even coherent or logical. If UTA hadn’t built the rail system they now own, and had instead invested in a Fitted Bus Route System you would be happy? I’m sorry that UTA didn’t do what you want, I really am, but the rail transit solution was the right decision for the Wasatch Front, the whole country is recognizing that, Some nut job that lost the bus route in front of her house isn’t gonna change it. I have been fighting a Good Bus System since 2007, before UTA cancel my Bus Route I Care about People. UTA has Build a Empire Trax, FrontRunner and StreetCar all for GREED, UTA Encourage Individual’s to Drive to a Park & Ride Lot. UTA does want Service the Transit Dependent are define as those who Depend on Public Transportation for their Mobility and Personal Viability because of Low-Income (the Inability to Afford the Purchase or Maintenance of a Car or Cars for One’s Family) age (Either to Young or Old to Drive) or Disability. Taking Bus Out of Neighborhoods Increase Poverty and Crime. UTA is not a Car-Free and Transit-Oriented System. Here in the Los Angeles area we have John Walsh, a “transit gadfly”, who regularly attends LA Metro and other transit entity board meetings to use the public comment periods to spout his half-baked opinions and ad hominem attacks on local political figures. Regarding Salt Lake City: It’s well known as the center of the Latter Day Saints or Mormon religion. The Mormons have inspired controversy since the days of Joseph Smith over 160 years ago, but they do have a reputation as being thrifty, prudent and family oriented. Promoting non-automotive transport as a step in protecting the enviroment, saving resources and making life safer would certainly fit in with these values. Will GOP Senators Acknowledge the Fiscal Sense of Livable Communities?